Earlier this week, Silhouette America released another update to their Silhouette Studio software. Those of you who have been following this blog may notice that I had stopped posting about the software updates since around last year. When the company started to release a new update every other week, and sometimes one within days of another, it was obvious that their program was not ready for the public. So I stopped posting about their updates on the blog and only mention it every now and then on my Facebook page. At this time, I am still using v2.9.67 aka the Legacy version because I find that not only does it have all the features that I need, it is also more fun to use than any of the v.3s. It's just a personal preference. That's all. 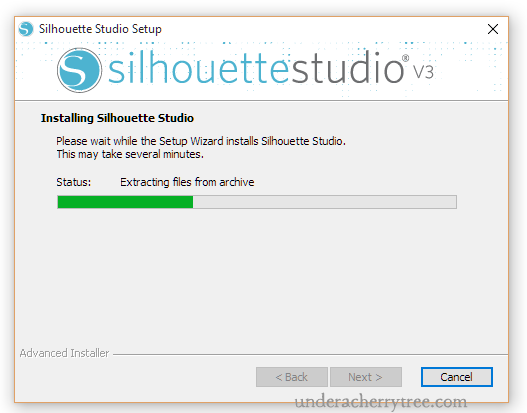 However, Silhouette's new v3.7.206 intrigued me. Just like when they released the very first v3, this version is kind of like a milestone because with this release, they are introducing the Silhouette Cloud and making it mandatory with every new release AFTER this version. While I am still using the Legacy version and have no wish to change how I use Silhouette Studio, I am curious about this Silhouette Cloud. Thankfully, Hubby is a techie and a gadget nerd so I have access to one or two (or five. Don't ask.) spare devices that I can use for testing. I went ahead and downloaded and installed the update. For the record, I am running Windows 10 on my test machines. The installation process went quickly and without issues. 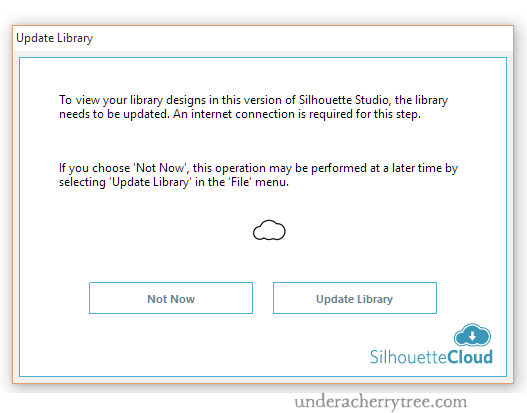 The Silhouette Cloud logo as well as the little cloud in the middle of the screen gave me the impression that I would be syncing my files and so I clicked "Not Now" as I wanted to see if there has been any changes to my library first. I was shocked when I found nothing there. My library has been emptied! It took me a moment to recover from the unpleasant surprise and then I remembered that first message that I had seen about updating the library. Reluctantly, I selected File>Update Library in an attempt to get my files back. Although I was relieved to see my library restored right after, I was not pleased that I was forced to sync my files. In order to test the program, I saved a few new images to my library and tried to sync again by using "Update Library". I was surprised to find that every time I do that, the program duplicates the images that I had saved to the library. 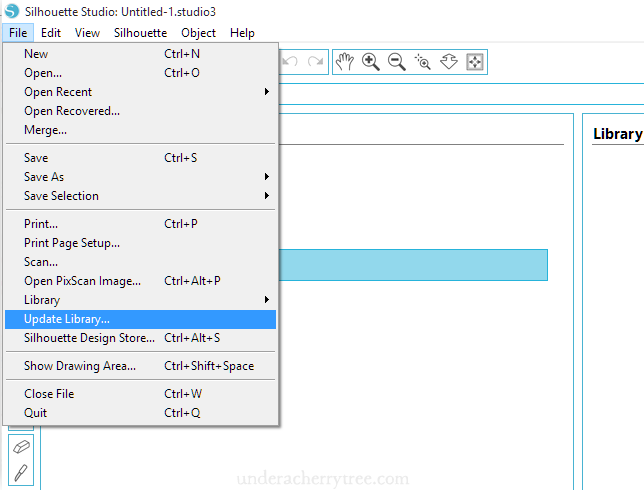 The shapes that I had purchased and downloaded from the Silhouette Online Store were not duplicated. 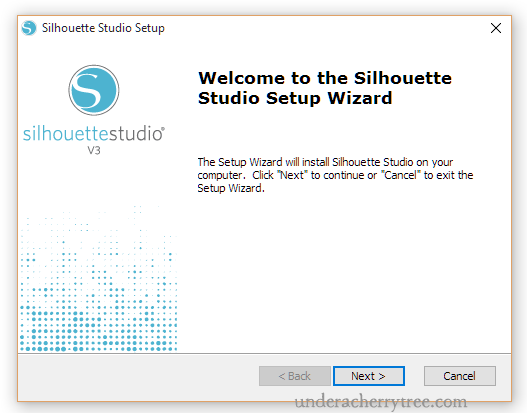 I was annoyed that yet again, Silhouette had released a software update that was not thoroughly tested. It wasn't until later that evening that I realized the issue with this update was a completely different problem from what I had initially thought. Hubby is my resident expert tech guru. After telling him about the "bug", I realized that the trouble with this update is not really about the software programming but more about the lack of proper instructions and information. You see, I had misunderstood when I saw that very first message. 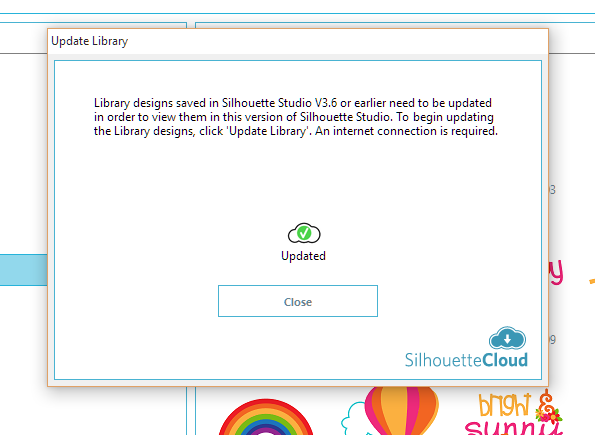 The Silhouette Cloud logo and the little cloud image had led me to think that "Update Library" meant syncing to the Silhouette Cloud. It actually does not do that. 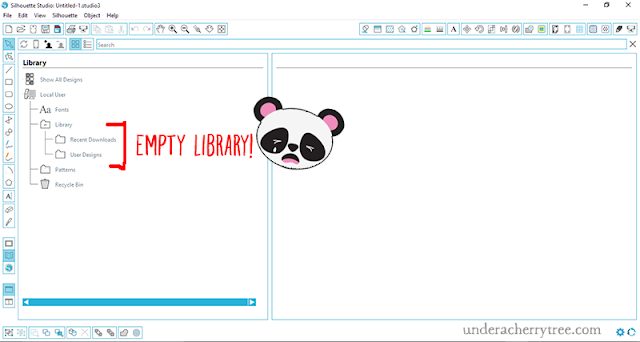 What it does is that it converts any old library files that are already on the computer into a format that can be used in this new software version. In fact, "Update Library" should only be done once and only when you first access the library after updating the software. 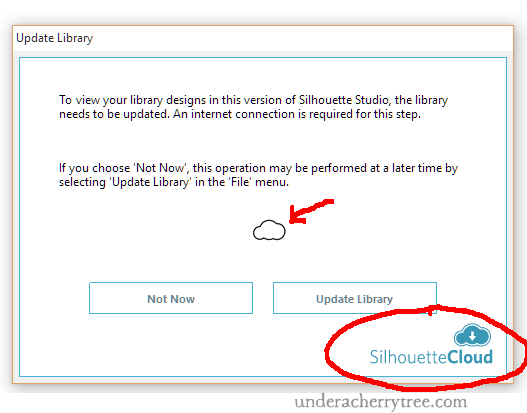 Clicking on "Update Library" is not the same as syncing to the Silhouette Cloud at all. In this case, the bug that I found is that every time I clicked "Update Library", the program duplicates the files instead of telling me that the action has already been done before. 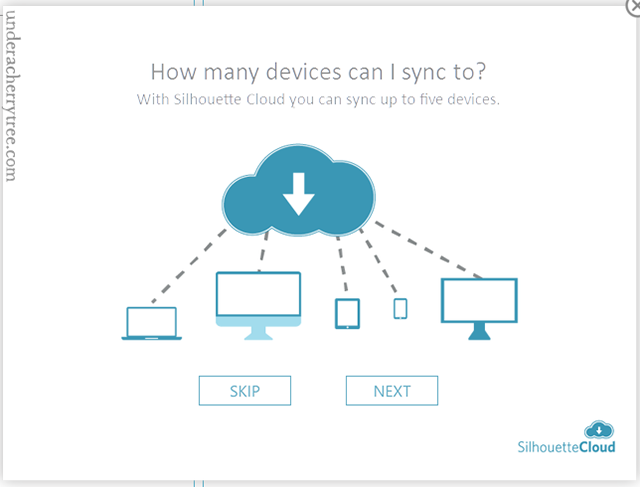 With the Silhouette Cloud, you can sync up to 5 devices. 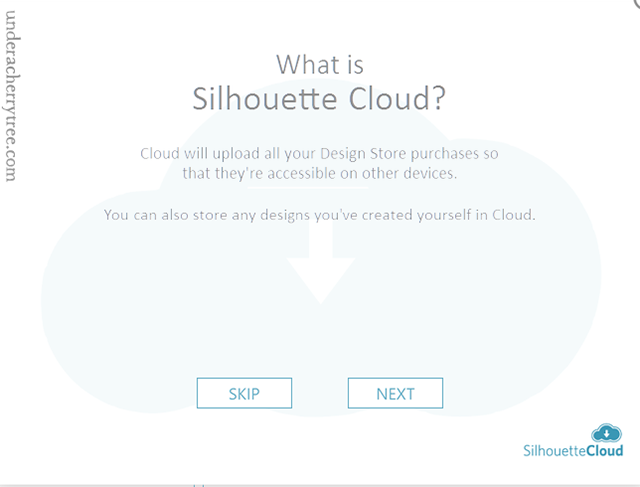 I absolutely love the idea of a Silhouette Cloud because it will allow me to access my designs from anywhere. I often upload my photos from my computer to Microsoft's OneDrive so that I can access them from my phone and it will be nice to be able to do something similar with my Silhouette Library. 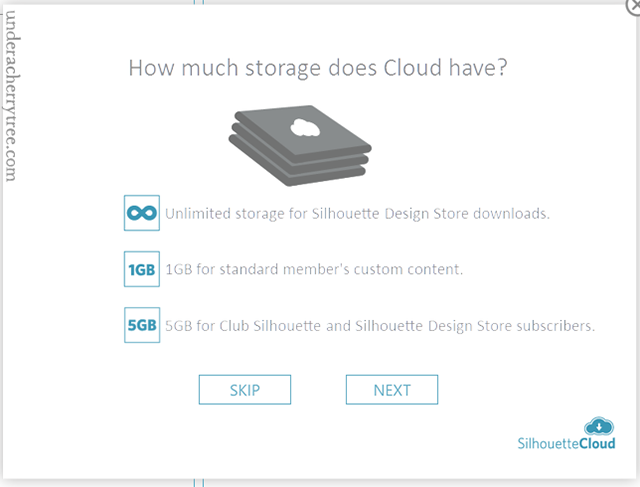 Just like One Drive, there is a limit to free storage in the Silhouette Cloud. 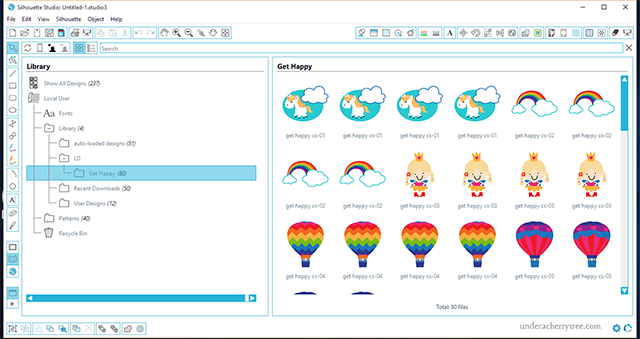 For any designs that were not obtained from the Silhouette Design Store, the limit is 5GB for Club Silhouette and Silhouette Design Store subscribers and 1GB for the non-subscribers. 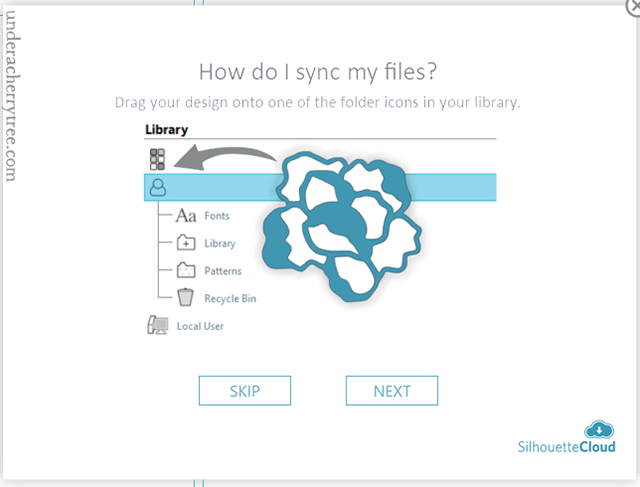 There is no storage limit in the Silhouette Cloud for any designs that were downloaded from the Silhouette Design Store. 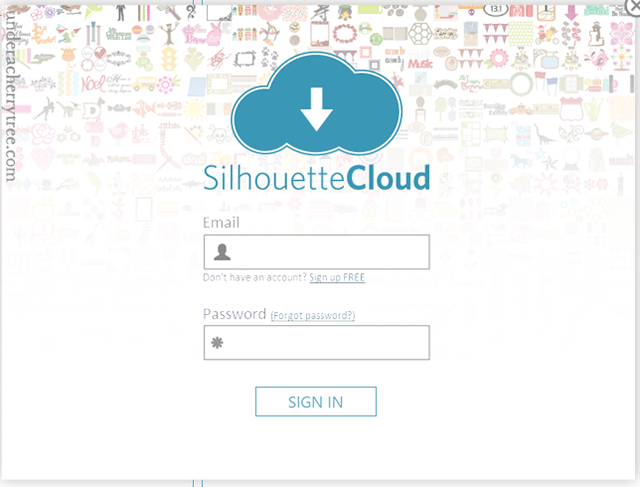 In order to sync to the Silhouette Cloud, just sign in using your email and password that you use for the Silhouette Design Store. Once you are signed in, syncing is supposed to be very easy and straightforward. Unfortunately, it seems to only work properly sometimes. 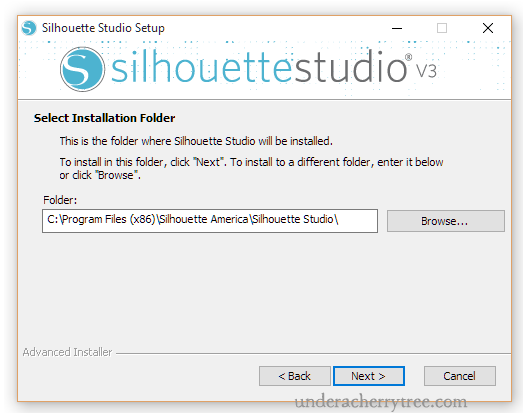 I stopped posting about the Silhouette Studio updates a while ago because I was getting tired of all the bugs that show up with every install. I did not want to waste mine and your time on a software update that did not work. The Silhouette Cloud sounds like a fantastic idea and I was really hopeful that this release will be flawless. Unfortunately, after trying it out for two days, it is apparent to me that the software still needs further tweaking. 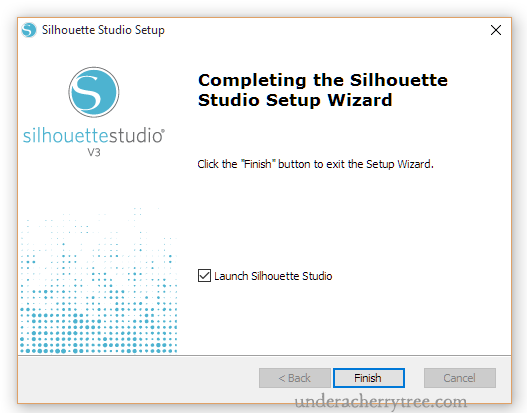 Silhouette America has indicated that going forward, all new Silhouette Studio updates will require the use of the Silhouette Cloud, and that users who do not install v3.7.206 or any other future updates will miss out on the new features that those updates will bring. 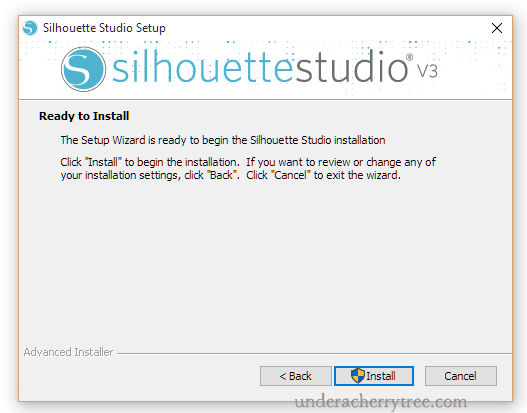 I apologize for sounding so negative but if the Silhouette Studio version that you are currently using is working well for you, I urge you NOT to install v3.7.206. Until Silhouette releases a version that is reliable, attempting to use the Silhouette Cloud will only waste your time and bring you disappointment. For further reference, click here to see a Silhouette Cloud Q&A from Silhouette America. There are new designs in the LD store and they are super cute! I always look forward to seeing all the LD new releases and I was really excited to see the It's All The Buzz and I Don't Know Why collections added to the LD store. The images are adorable! If you'd like to purchase the new designs, consider getting the bundle. 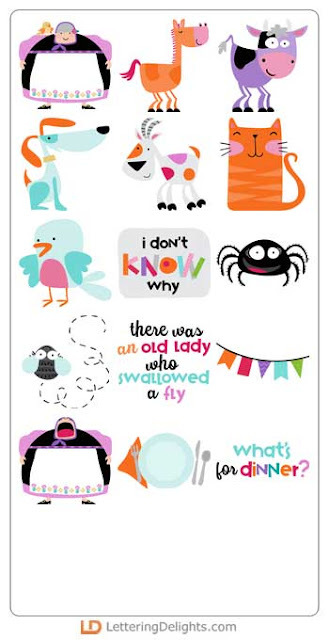 The Wiggle and Jiggle BIG bundle includes both the "I Don't Know Why" and the "It's All the Buzz" collections PLUS TWO FREE fonts for only $13.20! 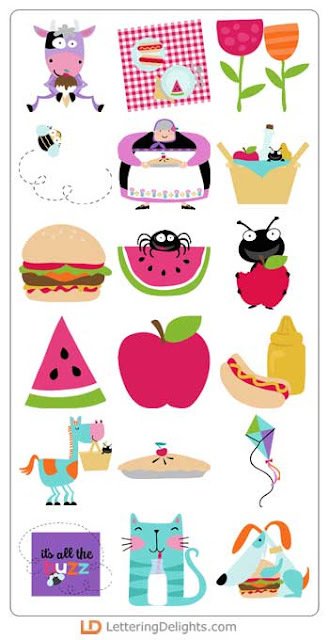 CLICK HERE TO GET THE WiGGLE AND JiGGLE BIG BUNDLE. Besides adding the new product to their online store, LD has also marked down the price of their Great Gift Giving bundle. The regular price of the bundle is $170 but for a limited time, it is available for only $28! CLICK HERE or the image above to go to the LD site. Add the I Don't Know Why Card - CP to your cart and checkout. You pay $0.00! 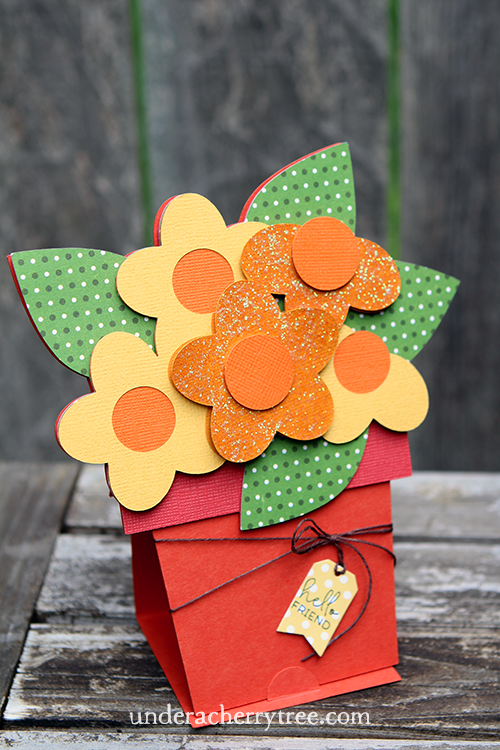 After having made the flower jar easel card, I thought I would try making the pot of flowers from the same LD Floral Shop - CP set. 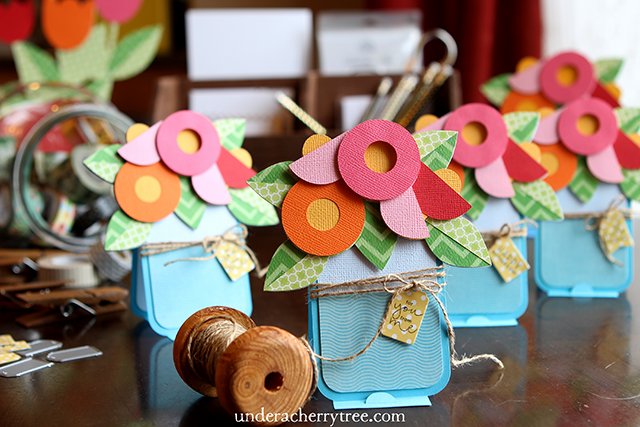 Just like the flower jar card, the layers for the pot of flowers were easy to cut and assemble. This easel card came together pretty quickly but the finished product looked rather flat. I went ahead and added some depth to it by "popping" two of the flowers. 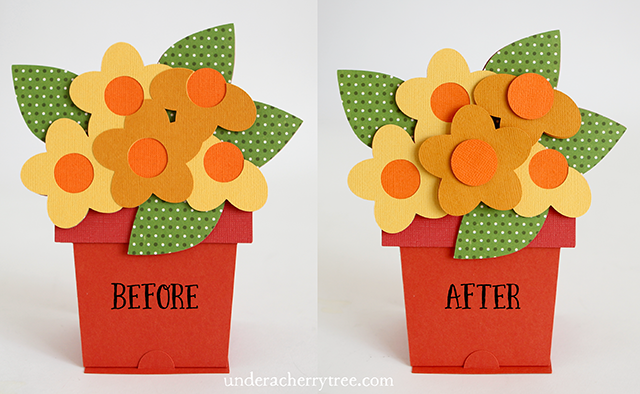 As illustrated above, I used the flower shape in file #9 from the same cut set to make two new layers for the card. 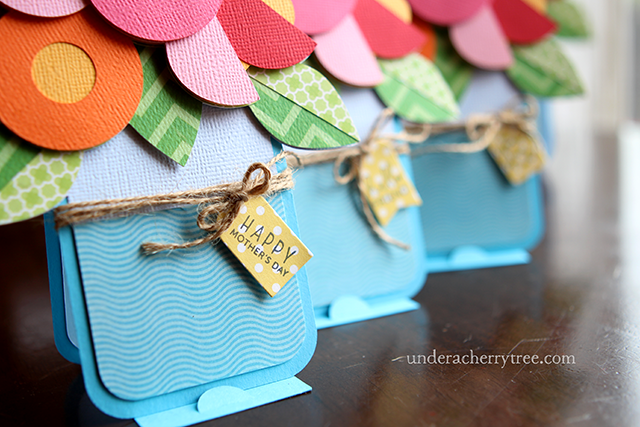 It is just a couple of easy steps but the added dimensions made the finished card look so much more interesting. 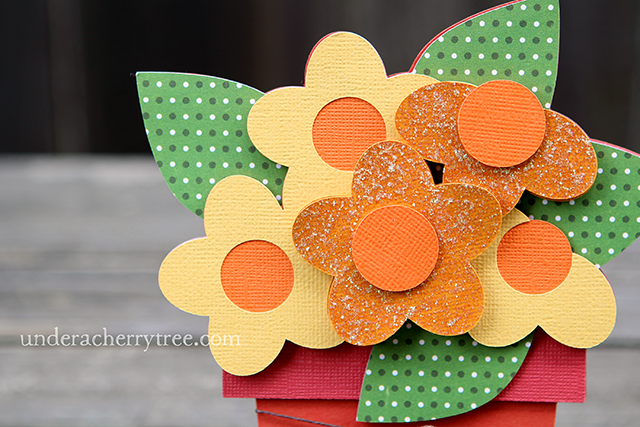 I used foam tape to attach the "half-flower" to the card. In order to make the main flower "pop" even more, I used two layers of foam tape to adhere it to the base. 46% off Silhouette Replacement blades and 44% off SSDE! The Silhouette replacement blade is on sale again on Amazon.The list price is $12.99 but right now it is 46% off or only $6.96! Time to stock up! 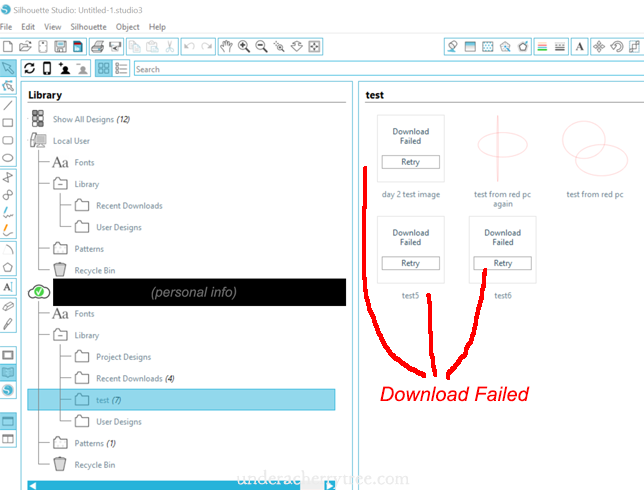 The regular free Silhouette Studio program that comes with the Silhouette cutting machine cannot open SVG files. 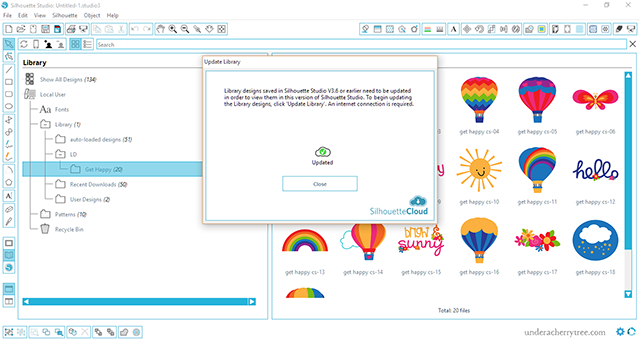 If you use SVGs, you will need the Silhouette Studio Designer Edition or a 3rd party program like Make-the-Cut to cut them with your Silhouette electronic cutter. The list price of Silhouette Studio Designer Edition is $49.99 but right now, you can get it for only $27.82. That's a discount of 44%! Amazon has frequent price changes and I don't know how long these offers will last. Click HERE to get your Silhouette replacement blades and HERE to get your Silhouette Studio Designer Edition before the prices go up. To see all the Silhouette deals on Amazon, just click HERE. HURRY! The Silhouette Cameo, the Silhouette Mint, and the Silhouette Curio are Amazon's Deal of Day and they are on sale at a great discount! The Silhouette Cameo Starter bundle includes the cutter, 2 mats, 2 blades, a metallic sketch pen set, a pick-me-up tool, and a 1-month basic subscription to the Silhouette Design Store. The list price is $344.95 but is only $179.98 during this sale. That's 48% off! Great deal! If you have been wanting to try the Silhouette Mint, get it while it is 73% off! I bought mine for a lot more and am kicking myself for not waiting. It is only $61.77 now, down from the List Price of $229.99! CLICK HERE TO GET THE SILHOUETTE MINT STAMP KIT & INK BOTTLES. The Silhouette Curio is the third item on the Amazon Silhouette Deal of Day offers. The List Price is $249.99 but during this sale, it is available for only $135.99. That's a discount of 46%! CLICK HERE TO GET THE SILHOUETTE CURIO. These offers are only available for a few more hours or until they are sold out. GET THEM before they are gone! Whoa, the Pixies are here! 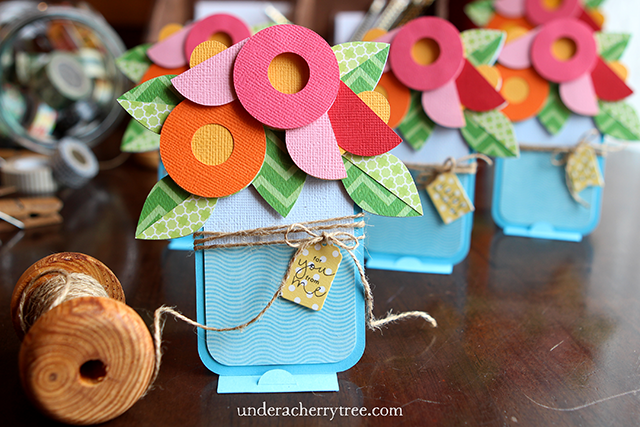 LD's latest collection is full of pixies, tiny houses, and fairy doors! CLICK HERE TO CHECK OUT THE NEW PIXIE TALES COLLECTION. While you are at the LD site, don't forget to shop the Mother's Sale Day. For a limited time, all Mother's Day related products are 75% off! Bundles are not included in the promotion. CLICK HERE TO SHOP THE LD MOTHER'S DAY SALE. 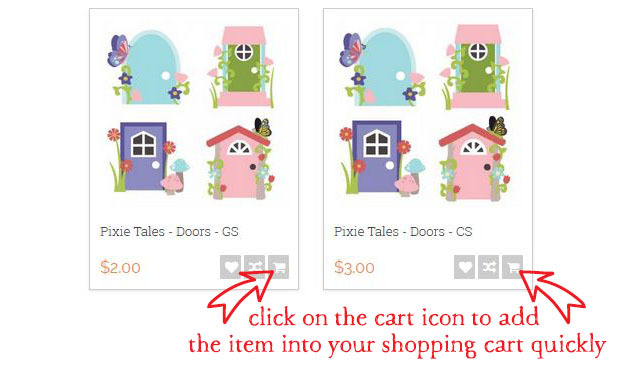 To get the free Pixie Tales- Doors graphic set and cut set, just click HERE or the image above to go to the LD site. The files will show up at full price but if you add them to your cart, they will change to $0.00. 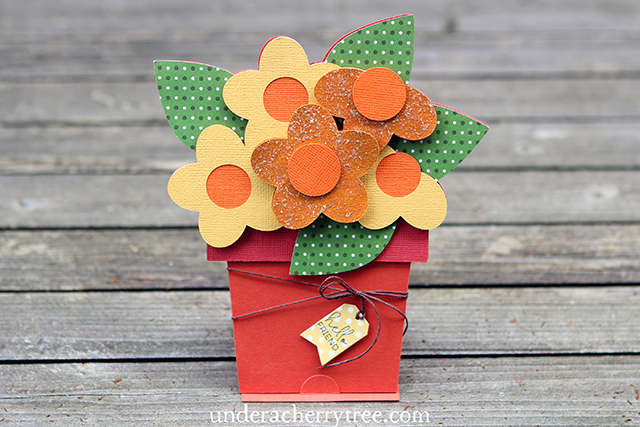 Floral Shop is the current "Earn It Free" collection that LD is offering. 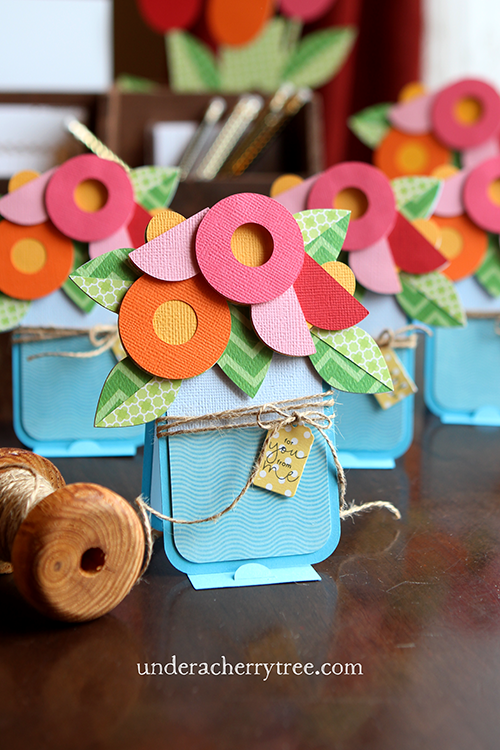 While I have not used all of the files, I am smitten by the Floral Shop Cut Project. 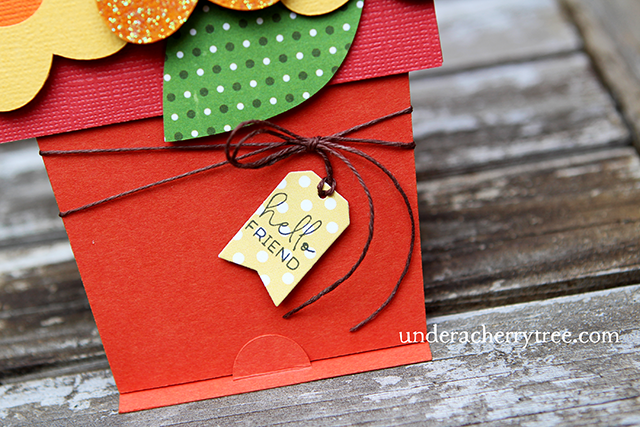 The easel cards are so pretty and easy to use! 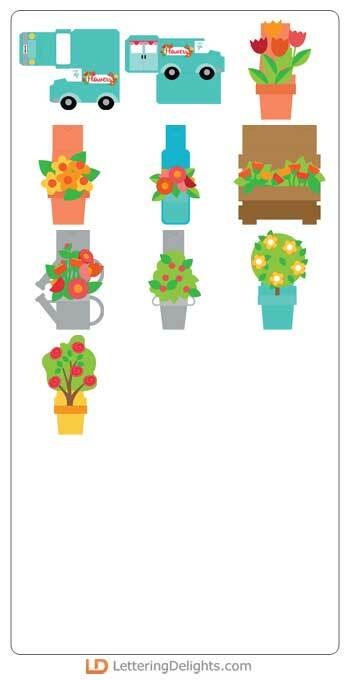 The set comes with 10 files, including 8 cards and a flower truck box/holder thingy. I have yet to cut out the truck but I thought it looks very similar to their Taco Truck and Ice-Cream Truck. I did try 2 files- the pot of tulips and flowers-in-a-jar. They are very easy to cut out and I love them both so much I really want to make the other cards! 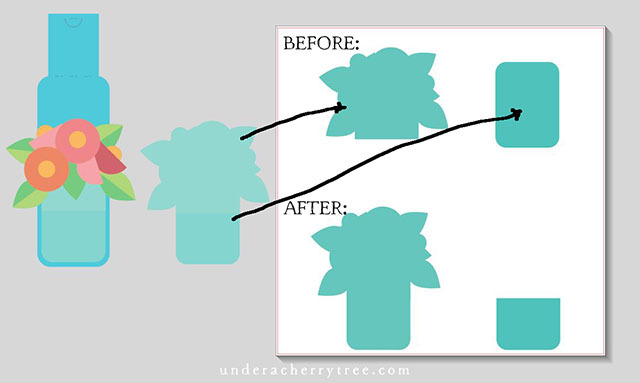 When I first cut out the layers for the card, I wasn't sure where to place the flowers onto the card base because the last layer is just a rounded rectangle. So I modified the file by welding together the last 2 layers. 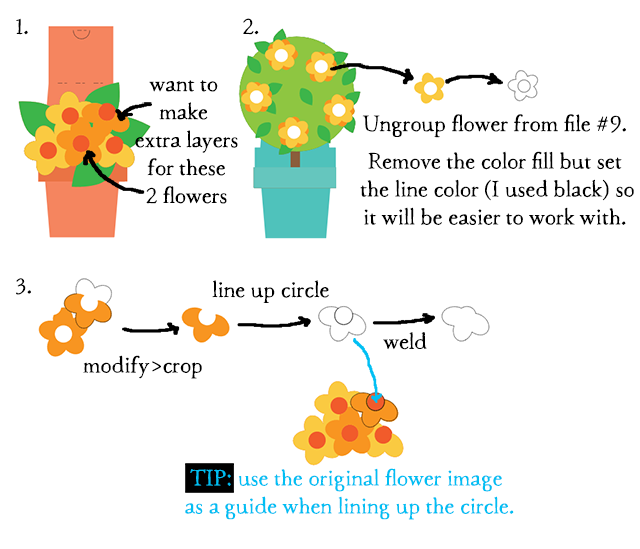 Now I know exactly where to glue the flowers. Yay, me! lol. I also dressed up the cards by adding a little tag to each of them. By changing the greeting on the tags, I can use the cards for almost any occasion! If you do not have the Floral Shop Cut Project yet, click HERE to get it or click HERE to see how you can get the whole collection for free. Check back here later to see what LD is giving away for Friday Freebie.